Sorry. 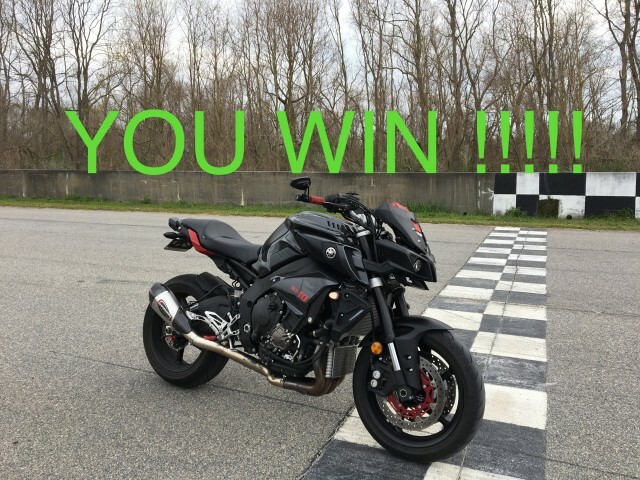 The first pic is off the bike, but the step is clear. this is a simple installation, but they don't provide clear instructions. Reach out to the company you purchased from or the company who made it. I've always had companies send me missing items upon request. TWM was very cool about sending the screw and gasket kits. I bought my Chinese TWM knockoff and waited 2 months and came with only the cap. I am having issues getting the key out of the lock. 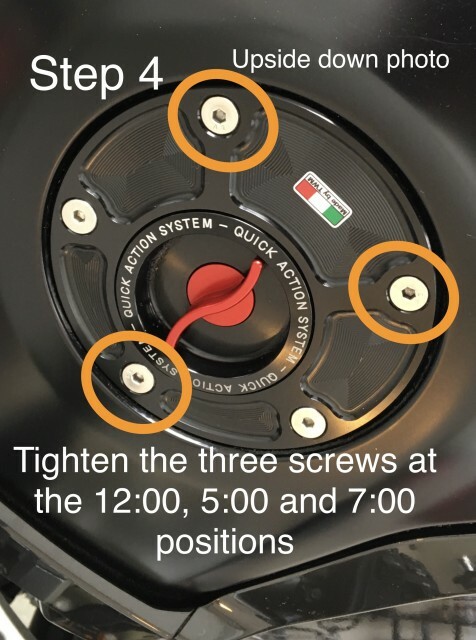 If I lock the tank before removing the fasteners you've labeled as 2, the cap won't come of the tank. 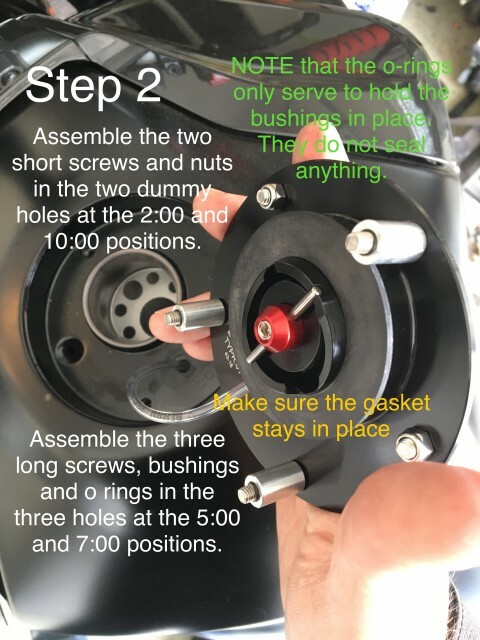 If I remove the cap from the tank, I can't get the key out even when compressing the spring-loaded sealing mechanism on the bottom. Did you remove the security bolt under the fuel cap? 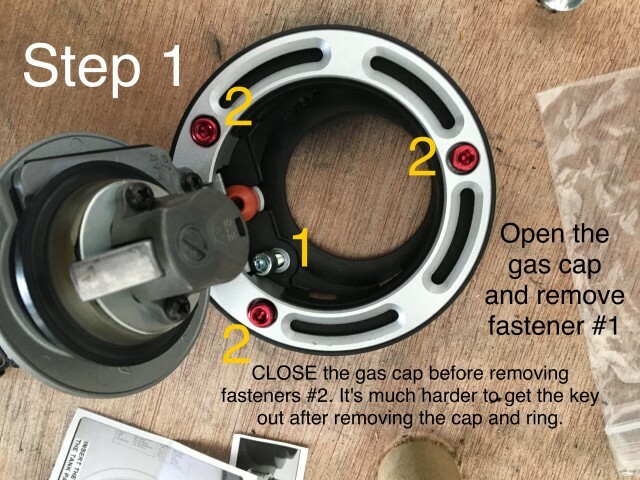 Remove that first and then lock the cap and remove the key, then you can proceed to remove the three exposed bolts around the cap, problem solved. Maybe I'm being dense, but even with the security bolt removed I was unable to remove the cap. I will try again this evening. Edit: I checked again this AM and when I lock the tank it seems to latch to the tank itself. 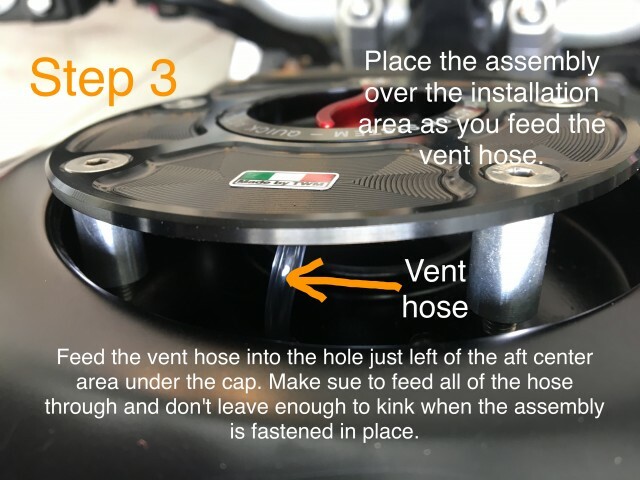 If I remove 'fastener 1', lock the tank, and then remove 'fasteners 2', the cap is latched in. I wonder what the OP's solution for this is. I'll try compressing the springs and turning the key with the cap off this evening.